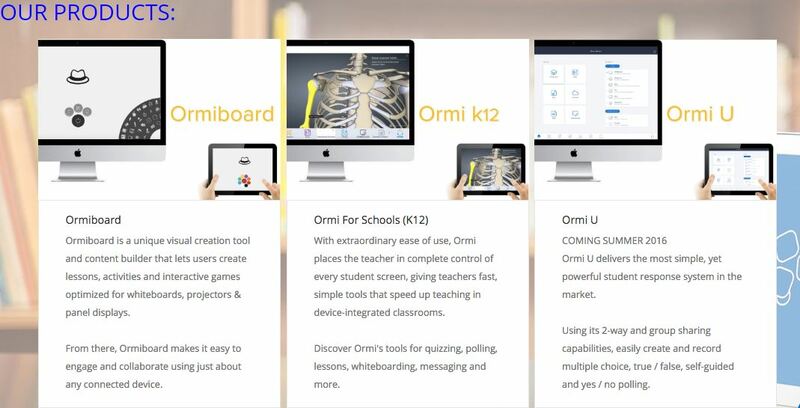 Ormi: a platform that let teachers distribute content, manage screens, assess students and coordinate activities, while integrating outside resources. A virtual learning environment (VLE), or learning platform, is an e-learning education system based on the web that models conventional in-person education by providing equivalent virtual access to classes, class content, tests, homework, grades, assessments, and other external resources such as academic or museum website links. It is also a social space where students and teacher can interact through threaded discussions or chat. It typically uses Web 2.0 tools for 2-way interaction, and includes a content management system. Virtual learning environments are the basic components of contemporary distance learning, but can also be integrated with a physical learning environment which can be referred to as blended learning. Virtual learning can take place synchronously or asynchronously. In synchronous systems, participants meet in “real time”, and teachers conduct live classes in virtual classrooms. Students can communicate through a microphone, chat rights, or by writing on the board. In asynchronous learning, which is sometimes called “self-paced” learning, students are expected to complete lessons and assignments independently through the system. Asynchronous courses have deadlines just as synchronous courses do, but each student is learning at his own pace. A virtual learning environment can also include students and teachers “meeting” online through a synchronous web-based application. The teacher is able to present lessons through video, PowerPoint, or chatting. The students are able to talk with other students and the teacher, as well as collaborate with each other, answer questions, or pose questions. They can use the tools available through the application to virtually raise their hand, send messages, or answer questions on the screen given by the teacher or student presenter.